One of the first things decided upon with the design of Meccano was the use of 8 gauge wire for axles. This determined the size of the holes in the perforated strips, and from there the unusual size of the nuts and bolts. It is one of the few Meccano parts that has hardly changed in a century, and yet there are subtle differences, as you will see. Note: The numbering system for axles changed substantially, and is very confusing. 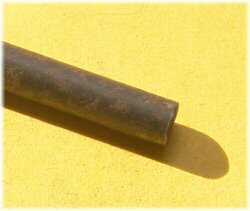 Extremely early rods were not numbered, and supplied in lengths for the user to cut to length. For a while various part numbers were shared by more than one length. Most numbers had settled down by the start of Meccano in 1907, except for the 1'' rod as shown, which was initially given the number 18, temporarily given the incorrect number 18a and then moved to 18b (to be in the correct sequence) in 1922. 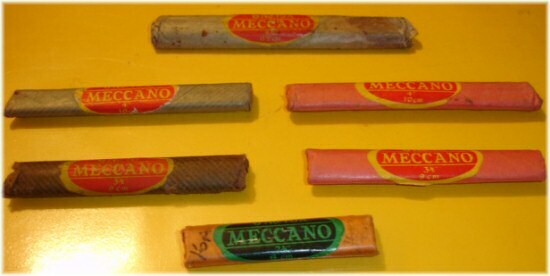 The photo above shows the full range of axle lengths available since the start of Meccano in 1907. The lengths run evenly from 1'' through to 6½'', then the 8'' and 11½'' at the bottom. Although the majority of these axles are mid-50's, the 6'' rod is an earlier version of the 6½'' rod pre-1925, and the 5½'' rod wasn't introduced until 1962. The first (MME) axles were grooved to accept the MME 'feather' key. As stated above, part numbers and lengths changed considerably during this early period. But, after around 1907, the groove was removed and the parts became as we are all used to. The only significant change was to the ends. Early (pre-war) axles have their ends cut off sharply, as shown by the left-hand axle in this photo. Lengths were not particularly accurate. In the 30's the axles gained 'milled' ends and a much better consistency of length (as per the middle axle in the photo). The length is measured including the rounded ends. It is my opinion that later 70's rods can be easily identified by a much rougher end-milling as shown in the right-hand axle, although there are no DMS part numbers for these. The axles in the Mechanised Army outfit (1939-41) are blackened, and easy to identify. However, in an outfit recently investigated, the 6½'' and 4½'' axles had milled ends (as would the normal axles), but the 2'' axle had cut-off ends as shown to the right. This is unexpected for this era. The picture above shows a range of different packs for axles. At the top is the oldest, the patterned brown shiny paper pre-war (although these I believe are wrapped axles from an outfit, rather than for individual sale). The paper envelope at the bottom left is also pre-war. Yellow boxes date from the 50's, and the lighter yellow long box for part 13 is later still. Note that the axles are packed in a similar way to the strips: parts 15 and 14a are in the same box, as are parts 16 and 16a. Part 18b is still packed in 12's. At the bottom right is an unusual red box from the late 60's (is it? ), with a white sticker showing the part number (16A). The photo above shows a range of pre-war axles. The bottom one is the earliest, with the green sticker indicating the red/green era (1928-33). The red-on-yellow scalloped stickers follow this, we believe, with either brown or light red paper wrappings. The top axle (part 15a) is immediately pre-war. Note that all the lengths are also shown in centimetres at the bottom of each label. Note 1: 11'', 5'', and 2' rods are shown in EMP as "rod, no groove" from 1905 then "as above in mild steel" from 1918. 6½'' and 3½'' rods show no change to mild steel, and 8'' is shown as mild steel from 1910. It is likely that the third row of the above table is inaccurate, use the fourth for most pre-war Meccano. Check the top table for the dates of introduction of the later axle lengths. 2: Although EMP gives the date of removal of the MME groove as 1905, Love & Gamble show the introduction of plain rods only in the Duke St factory in mid-1907. The datasheet above shows that the 1" axle first appears in the No. 4 outfit, but the parts generator indicates that it first appears in No. 2. 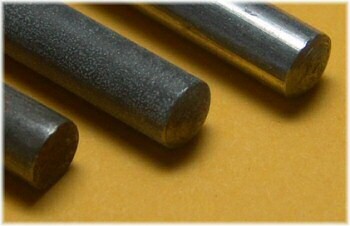 - in the table, the axles supplied in early Multikit are termed "milled"; in fact, they are knurled. I also have several extra long axle rods with correctly domed ends at 14.75" long. They are out of a dealers display stand, all Meccano built at about 4 ft tall. I also have four 8" axle rods, correctly domed ended butthey are nickle plated brass..!!. Hi Stan, the text in the datasheet table says part 14 was 6" until 1925 when it became 6.5". In this section about axle rods the illustration shows a 6 inch one, and the text infers it, but I think the only 6 inch one Meccano ever produced was one that replaced the 6 1/2 inch one in 1924. Is that right?